No worries, we’ve still got our well appointed collection of classic business essentials, but our new collection of dress shirts, ties, shoes and more has got us all excited here at Paul Fredrick. So rather than waiting for things to warm up outside, we’ve got Spring in full swing right now. Check out our fresh assortment of polished choices and gear up for a new season right around the corner. It somehow makes the temperature outside feel just a little less cold. Somewhere along the sartorial timeline, hordes of men became convinced that blue and grey were the only acceptable colors for suits. If you’re reading this, odds are you’re not stuck in that narrow mindset. Still, we’d like to encourage those whose suit wardrobes are a bit basic to consider broadening their horizons, as well as assuage those who embrace color and pattern that we’ve got you covered. This fall our campaign against the ordinary includes earth tones such as chocolate brown and olive. 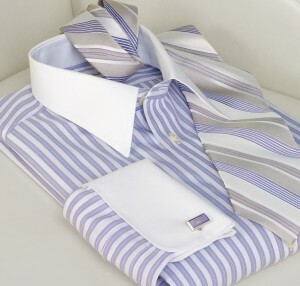 We’ve given brown a shot of elegance and formality by rendering it in a double-breasted pinstripe model, as well as a single-breasted version with subtle lavender stripes. That exchange, direct from F. Scott Fitzgerald’s novel, is drawn out for even more dramatic effect in Baz Luhrmann’s new glitz-loaded adaptation, which opened May 10. And how appropriate, as we’re in total agreement with the Gatz: When you see the sartorial splendor of the film, which is set in 1922 New York, you too will want to repeat the past.